***Who Am I? Preschool Teacher's Manual: Click here to purchase a discounted copy on the Bargain Basement. All Bargain Basement items are unused, current editions with cosmetic defects only. The Preschool Teacher’s Manual is designed for 3 to 4 year olds and is meant to be used with Workbook A (for 3 year olds) and/or Workbook B (for 4 year olds). This means that while your preschooler is using Workbook B, a younger child can participate in the same preschool lessons using the activity sheets from Workbook A. 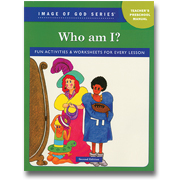 The Preschool Teacher's Manual includes lesson explanations, Bible stories retold for children, craft ideas, review questions, action rhymes, and reproducible patterns for the suggested crafts. 26 lessons, including 9 seasonal lessons (Thanksgiving, Advent/Christmas, Lent, and Easter). 9"x12", coil bound, 181 pgs. Each workbook includes about 50 tear-out, full-color worksheets that correspond to the lessons in the Teacher's Manual. On the back of each workbook sheet is a summarized outline of the lesson including suggested activities.